Over the last couple of weeks I’ve looked at the distribution of athlete splits across every Ironman race in 2011 and 2012. 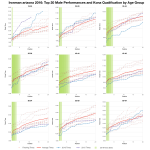 In the interests of inclusivity I incorporated every age group results in the spread – form the fast splits of the pros to the slower results of the oldest age groupers. If you are happy to assume that race fields are drawn from comparable pools of athletes they are a simple way to visually identify more competitive fields and tougher courses, but if you are a 33 year old woman they won’t necessarily give you a good picture of how the women’s 30-34 year age division tends to fair. For a would-be Kona qualifier your race is within your age group and that information is telling. 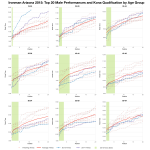 With Ironman Arizona coming this weekend I thought I’d look at how splits distribute across the age groups and how Kona Qualifiers performed. Actually finding the Kona qualifiers is another matter – I had the 2011 results to hand, but nothing that indicated who qualified. I have seen lists in the past, but this time Google drew a blank. Although a few races do publish their qualifier list it seems in the current Ironman website redesign there’s no room for Kona qualification data. Frustrating to say the least, but fortunately someone, thanks Emma, had the sense to collect the data when it was available, so while it appears to have vanished from the wider web a record of all Kona qualifiers at 2011 races does exist. That said after all that effort – and eventual success – upon adding the data to my spreadsheet this morning I decided it didn’t add sufficient value to the existing graphs to be worth investing time replacing them! Laziness may have cost me some interesting data. 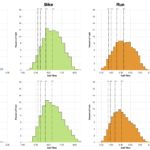 Which, by way of a long introduction, brings me to today’s point: a break down of the distribution of splits by gender and age division at Ironman Arizona 2011. These are similar to the previous charts on split distribution, the only change is a switch to percentage of field rather than the absolute number of finishers in each division, but it makes no difference to the shape of each graph. Before looking at the age group breakdowns, it’s worth recalling Arizona’s charts for the entire field. Splits are broadly spread and largely uniform in shape, typical of the distributions we’ve seen at both 2011 and 2012 US races. Arizona doesn’t stand out as exceptionally hard and the field contains a wide mix of abilities. We’ll start with the men, not out of any gender bias, but their greater numbers make for better graphs. Unsurprisingly the professionals show a heavy leftward skew towards faster times – as we would expect and as it should be. The youngest and oldest age groups are smaller and show a dispersed pattern of results, but what struck me is how similar the distribution of splits is between the ages of 30 and 60. There is a left to right shift overall, but it doesn’t appear particularly distinctive in this visualisation. Age matters less than I’d expected. No wonder it’s just as hard to qualify in your fifties as your thirties – nobody is slowing down! The women’s field is a little harder to read – the lower number of athletes opens up gaps. That said we see a comparable pro skew, young and old dispersal and perhaps there is even that pattern between 30 and 60 of similar distributions, it just doesn’t seem as clear. At least now my hypothetical 33 year old woman can have some idea of the breakdown of her age group and see where her targets might place her with respect to her goals. Although, all it would take is exceptional weather to throw the regular pattern (and given I’ve only examined one set of Arizona results there’s nothing to say this wasn’t an unusual year). As interesting as it might be to expand this to other races with 84 individual graphs in the two images above it’s currently a labour intensive process. It’s becoming increasingly obvious that as I gather more Ironman data I also need better ways to handle it. Excel is restricting and the sheer volume of charts that my desire for completeness demands is often unwieldy; add to that the detailed analysis of Hawaii and Florida I received in my inbox this morning, thanks Rob, reminding me of the limited depth of the statistics I apply – none in this instance. I have ideas for a database and an interface to automatically produce graphs for any result set, enabling users to perform their own specific comparisons. A time consuming side-project, one that revives a lot of my previous development experience, and one I am increasingly keen to pursue.